Black trainer with thick sole and strong toe bumper. 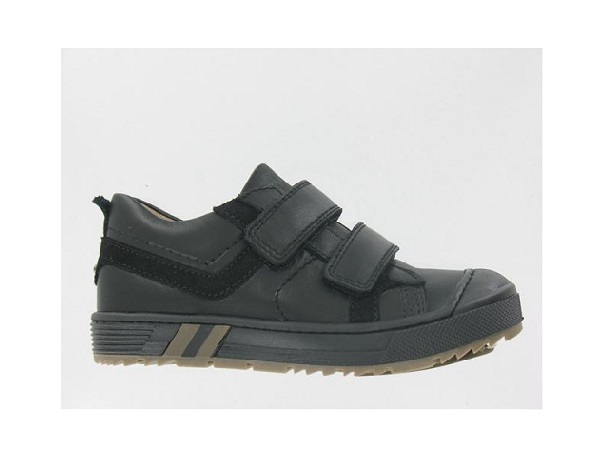 It is a leather trainer with good tread on the sole, two Velcro straps and a black line design throughout. Black trainer from Primgi with thick sole and strong toe bumper. This leather trainer has good tread on the sole, two Velcro straps and a black line design throughout. 1) When do we need to purchase my toddlers first pair of shoes? A child doesn’t need shoes until they are walking confidently. Bare foot is best. 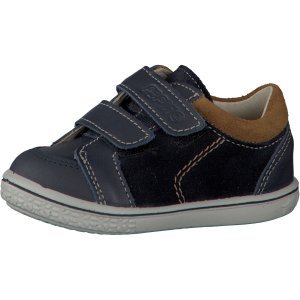 If you would like something on their feet whilst they are learning to walk, or you have been asked by your nursery to have something on their feet, then pre-walking shoes/cruiser shoes are the most suitable. They are lightweight, flexible, give good grip and provide protection over the toes. 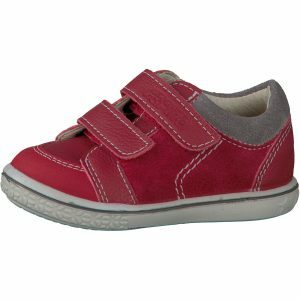 Once the child is comfortably walking across the room all by themselves, around 6 weeks after this, they can then be placed into first walking shoes. 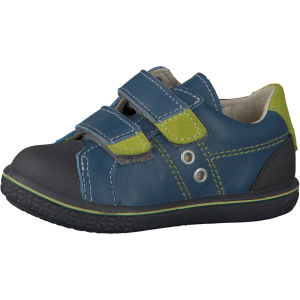 Walking is a huge learning stage in their development so our advice is that they become confident before going into their first supportive shoe. 2) What happens at the first shoe fitting? Our professional shoe fitters have a consultation with you to see what type of shoe you are in for. They will check the shoes you are currently wearing and measure your child’s feet, whilst looking at the shape of their feet, to allow them to select the most suitable style and brand. After selecting your shoes – the shoe fitter will place the shoes on your child’s feet and thoroughly check over the fit. They will explain how the shoe fits and look at the child walking in the shoes before making a judgement on whether they are suitable to purchase. A good shoe fitter will be confident, clear and honest with you throughout the service and will recommend what style of shoe fits best. You will receive a “First Shoe Certificate” with your child’s name, the date of purchase and the first shoe size. You will also start our shoe loyalty card. 3) How often should I get my child’s feet measured? We will never sell you a pair of shoes that is not required. 4) How quickly do my child’s feet grow in a year? On average children’s feet grow two full sizes in one year and all children grow at different times. As shoe fitters we will allow for sufficient growing room in your child’s new shoes – roughly a thumb nail of growing room. That being said, we won’t be able to tell when your child is going to have a growth spurt. 5) Why do we need to get my child’s feet measured and fitted? Great care is required to ensure that damage does not occur. This is critical in the early years when children’s feet are soft and fragile as they consist of soft cartilage, nerves and bones that are not fully developed. Starting them off in a badly fitting shoe is like building a house without firm foundations. You are storing up problems for the future that can easily be avoided. Image your child’s foot is like jelly. Putting them into shoes/socks/or even baby grows that are too tight can easily alter the shape of the child’s foot. A fully formed adult’s foot has 26 bones (more bones than any other part of the body), 100 ligaments and 19 muscles to be exact and takes 18 years to fully form which means we need to allow the best growth possible for their feet. Children’s feet come in all shapes and sizes – no feet are the same and no shoes are the same. It takes an expert to fit shoes. 6) How to check fitting at home? We have a step to step guide to help you fit the shoes on the child. Go to the homepage and click “CHECK THE FIT”. You have a choice of a written and video guide. A young child will not be able to tell you if the shoe is hurting, we always advise to check over the shoes properly before they are worn outside. Any queries please call the number at the top of the homepage. 7) What’s the best material for my child’s shoes? Leather is the best material of shoe as it’s the most breathable. Children’s feet perspire considerably and so it’s best to get a shoe that can allow as much air flow as possible. 8) What kind of shoe is best for my child’s foot? Leather which allow the foot to breathe. A shoe that offers ankle, instep and heel support. The soles of the shoes should be flexible to bend with the foot, as well as being light and non-slip for safety. 9) Where’s the best place to get my child’s feet measured and shoes fitted? We advise to go to your local independent shoe shop. Some of which will offer adults and children’s shoes and some who will focus solely on children. Most, if not all, independent retailers have qualified shoe fitters in their shop (always good to check this). Independent retailers will have a strong focus on their shoe fitting expertise because they want their customers come back time and time again. Team Treehouse know our local customers on a first name basis and have been fitting the children’s shoes since they started walking so they know exactly the shape of their feet and the style of shoes they like. 10) Can I pass down my oldest child’s shoes down to their sibling? Second hand shoes are worn down over time by the first child. By the time the second child puts them on their feet the support has been lost and the leather has been worn down, they won’t be giving the same stability and support that should be coming from a shoe. Everyday shoes tend to mould to a person’s foot, and as we know no two feet are the same which means the second-hand shoe could distort the second child’s feet. Wellies or crocs are the only shoes that can be passed down as they don’t have support and are already very flexible. We advise to pop in so we can check they are going to fit the child’s feet.